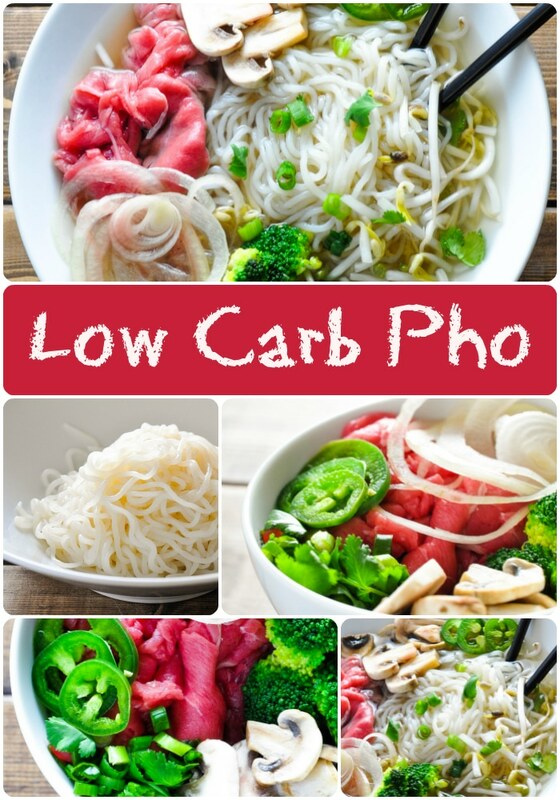 I’m so excited to share my low carb pho recipe with you! Pho is one of my favorite foods ever and is the ultimate comfort food to me. I have so many memories tied to this dish. My husband and I went on our official first date at a hole-in-the-wall pho restaurant after I raved and raved about the soup. I’ve trekked to the local pho joint mid-hangover with my BFFs knowing at the end of our journey we’d all feel 300% better. My sister and I regularly frequented one spot simply because she thought the server was cute and we would talk about what their hypothetical child, Minjiffany, would look like (Minji + Tiffany – I still remember, Tiff!). So many good things come to mind! Unfortunately, pho is as noodley as they come. The dish is traditionally served with rice noodles, which have a MILLION carbs in them. Well, not a million but close enough. 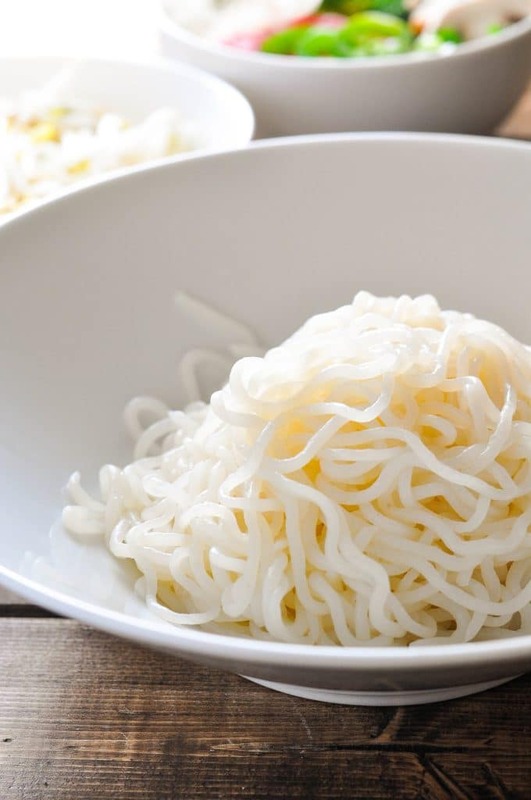 Just 1 cup of rice noodles has 42 net carbs! That’s roughly equivalent to a candy bar. Psh. No. Not anymore, pho. Or so I thought! You see, after all these years of devouring pho left and right, I had never learned how to make it myself at home. I always swung by my favorite pho place whenever I got a hankering for beef noodle soup; it had become like fast food to me. After going keto, I started to miss my beloved soup, and I just had to make a low carb pho to curb my cravings. 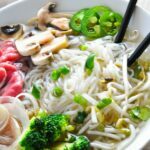 I had learned to make a pretty good bone broth with my pressure cooker but hadn’t experimented with pho broth ever before – let alone a low carb pho broth. It usually takes hours (and hours and hours) to simmer on the stovetop, but I don’t have time for that. At all. I contemplated picking up pho to-go and just tossing out the noodles, but I have a hard time trusting that the broth they make doesn’t have sugar in it. Hint: it does. So out comes the Instant Pot , using this recipe for reference and I begin constructing my game plan to perfect my version of low carb pho. Rice noodles are out, obviously. I decide Shirataki Noodles are my best-bet to substitute for many reasons. First of all, they have NO carbs! Zip, zero, none. Although they only have 30 calories in an entire bag, Shirataki Noodles are actually quite filling. They also have the same underlying texture and appearance I’m looking for; there’s a little bite to the noodle, and if you choose the long, skinny spaghetti-like strands it looks pretty darn close to the real deal. I have had great success using them for low carb Asian dishes, including stir-fry recipes and even fried rice. I was pretty confident they would work well in a noodle soup, but it turned out better than I had imagined! For this dish, you don’t have to do much with the noodles, just rinse them off in water and strain. For the broth, I parboil the bones for 15 minutes to remove impurities and increase clarity of the soup. Then I throw everything broth-related into the instant pot: the bones, onion, ginger, fish sauce, and water. I set my pressure cooker for 2 hours on high. When it’s done, I just strain it! You could then use it immediately or make it ahead of time, freeze and boil when you’re ready to use it. Now, I could just straight up drink this broth because it’s so good. But it wouldn’t entirely be pho without all the fixings now, would it? Sriracha – It’s delicious, I know. But watch your portioning: there’s 1 gram of sugar per teaspoon, so it is effortless to go overboard on carbs if you are a fan of the rooster sauce or like it super spicy! Chili Garlic Paste – The brand I use (Huy Fong) that is available at most restaurants has less than 1 gram of sugar and reads 0 total carbs on the nutrition label. Better option to make it spicy on a keto diet. Thai Basil – Super aromatic, this is a lovely herb for any soup. Plus its low carb! Cilantro – Have at it! This herb is keto compliant. Hoisin Sauce – Not keto friendly! It’s chalk full of sugar! Stay away. 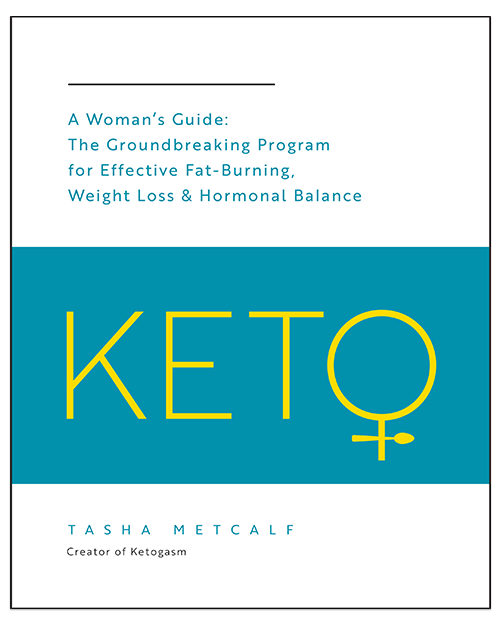 Meat – A-OK on keto. Select a traditional cut of meat or get creative! Up to you! The fixings are all optional dependent on preference and taste. A well-constructed broth usually doesn’t need much, so I leave a lot of the sauces out when I enjoy the way my broth turns out. Play around with it to find your perfect combo! There’s a variety of meats to include in traditional pho as this post over at Serious Eats illustrates, but my personal preference is to use raw flank steak shaved paper thin. 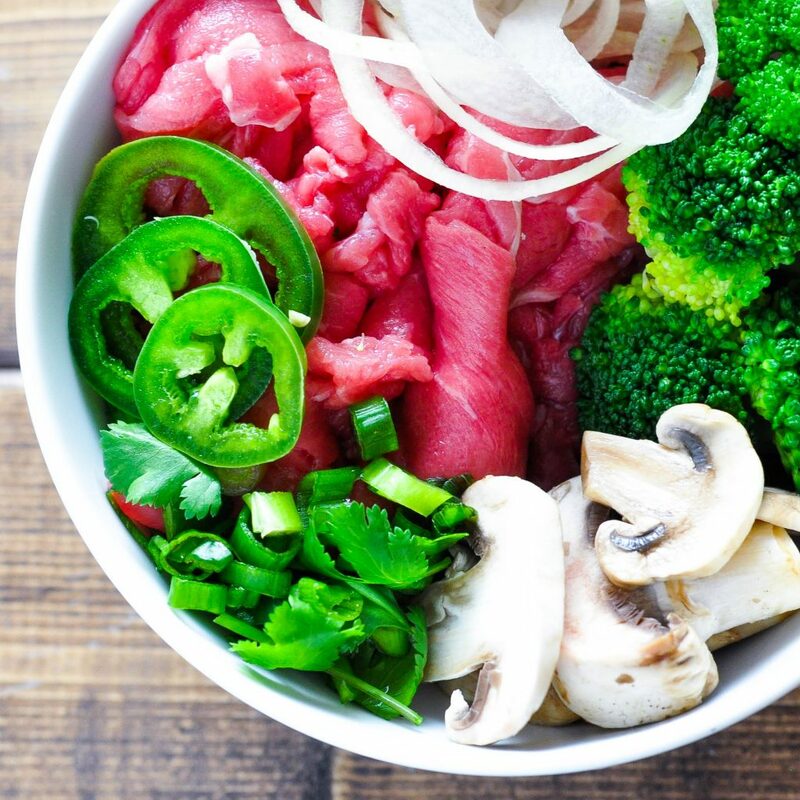 You can ask your local butcher to cut it for you or buy a side of the raw beef at your closest pho joint – but I guarantee you’ll get more bang for your buck at the butcher. When you are ready to serve, place the meat in the steaming hot broth in your bowl to let it gradually cook. Then add in the rest of your ingredients. 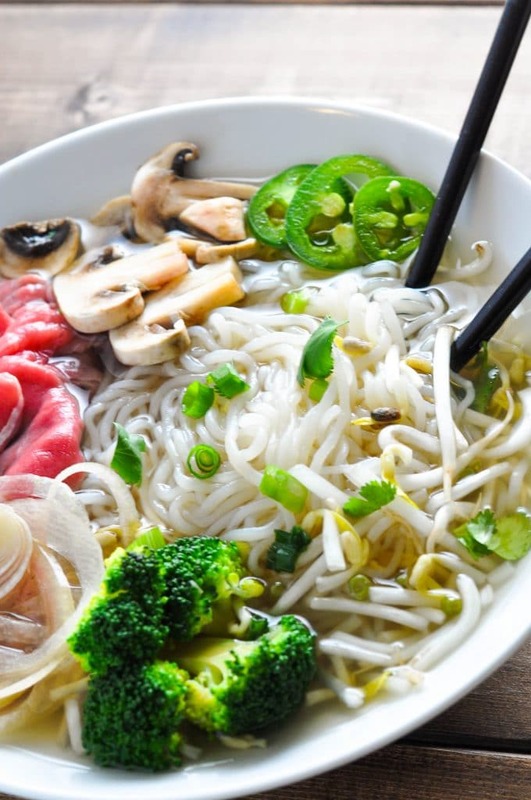 To serve, place your meat of choice and shirataki noodles in a large bowl and cover in piping hot broth. I would recommend tasting your broth before adding any sauces – you may like it just the way it is. Taste first, then season! Add your desired fixings, mix and slurp away! Enjoy your low carb pho! I like to plate the pho fixings separately in a community style bowl or plate to share with my family, that way we can all pick our favorite additions to the soup and I don’t have to worry about keeping everyone’s order straight. Even my toddler loves this dish! She demands “SOUP! SOUP! SOUP!” Like mother, like daughter. If you don’t have a pressure cooker, you could just use the stovetop method. But I would seriously consider getting one to save you some prep time in the kitchen. It’s much easier to stick to a diet when you can prepare things on the fly and make things as uncomplicated as possible. I use an electric pressure cooker called the Instant Pot so I can set it and forget it instead of staring at the stovetop. I’m a bit of an Instant Pot evangelist since getting one for my birthday last year, I use it constantly and preach to my friends and family about it. But there are plenty other pressure cookers out there that will get the job done! 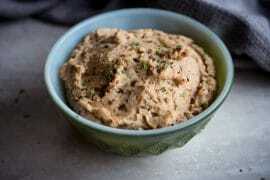 What is your favorite comfort food that you are missing on the keto diet? Let me know what you are desperately craving in the comments below! 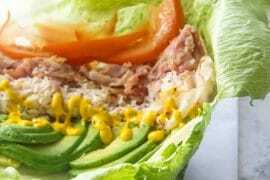 I’d love to help you put together a low carb version of it! As always, I appreciate the feedback and would love to hear from you! Now you can enjoy pho without the carbs! 5-6 beef soup bones browned and roasted - the more connective tissue, the better! Cover beef bones in water and boil for 15 minutes in a large stockpot on the stovetop while the oven preheats. Discard water. 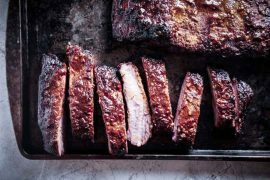 Place parboiled beef bones and onion on baking sheet or casserole dish and roast for 45 -60 minutes, until bones are browned and onion is blackened. Toss bones, onion, fresh ginger, salt, fish sauce, star anise and fresh water into pressure cooker. Set pressure cooker to high pressure for 2 hours. If you are using a stovetop, you will simmer for 6-8 hours instead. Strain broth with fine colander. 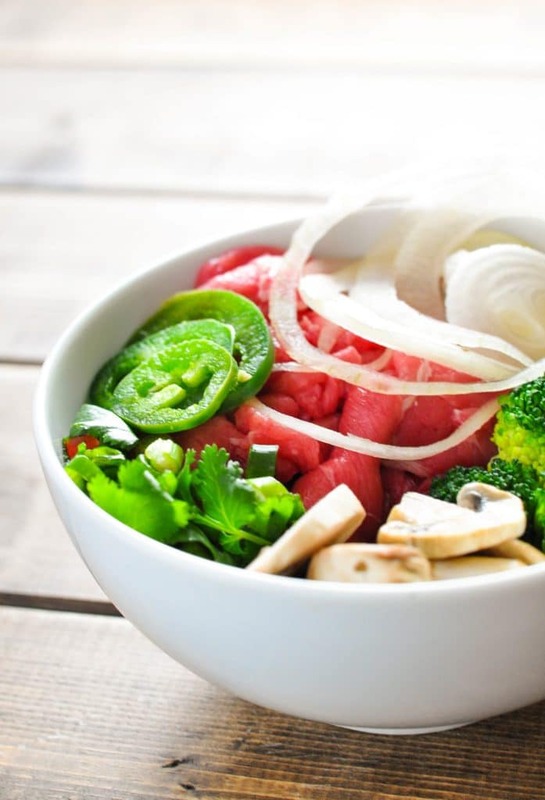 Place shirataki noodles and meat of choice in bowl, pour broth over the top into bowl while it is still very hot. Stir and let sit until raw meat is no longer pink and noodles are cooked, 1 to 2 minutes. Serve with condiments and veggies of choice on the side. Only 3g carbs per serving! Disclosure: the product links included in this post are Amazon affiliate links to help support the blog. If you purchase something from Amazon using the links, I’ll get a small kickback from them which will be used to support and grow this site. I will only link to products I’ve personally tried and feel comfortable recommending raving about. 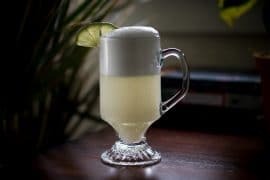 Gin Fizz Cocktail Recipe – Low Carb & Sugar Free! Previous articleDon’t be a fool! Eat avocado! 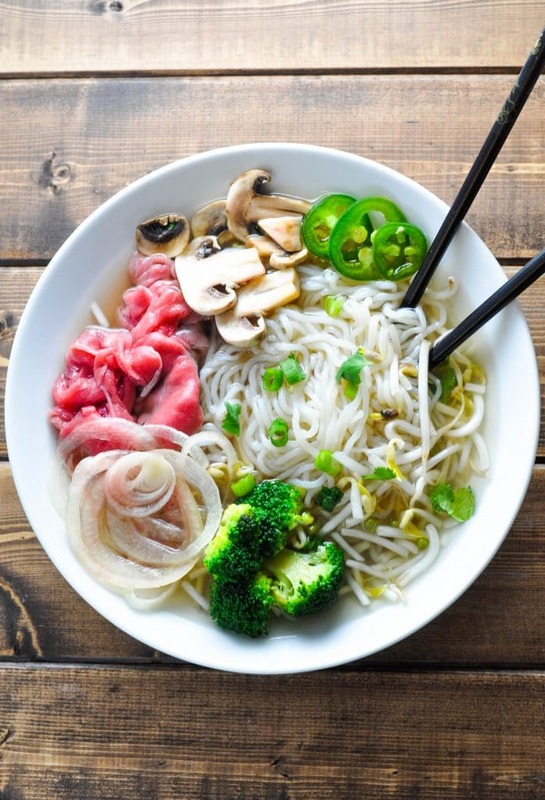 How much shirataki noodles would be in the typical restaurant regular bowl of Pho? Seems like it might be more than a 7 ounce typical shirataki noodle package. Yes but two packs is too much. 1.5 packs worked, had to waste the remainder. Hi, I made this recipe for tonight’s dinner. I used organic beef broth, but otherwise followed the recipe exactly. It was DELICIOUS! My hubby practically cried tears of joy! Thanks for sharing! Hi Susie! 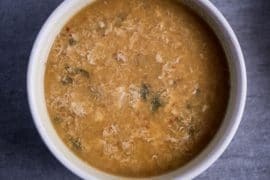 Did you add the ingredients to the beef broth that were supposed to be used to make the broth from scratch, or just used the premise broth on its own? Thanks!! Thank you Thank you! I’ve been on Ideal Protein (keto diet) and this week have been in Vancouvuer / stuck in hotels with their expensive and not so keto friendly menu’s. My saviour was a Vietnamese Pho stand in the casino of all places – and I could choose my broth/veg and protein. When I got home yesterday I realized there is nowhere near me that does it and I quite liked using my protein and veggies allowance in this way. I didn’t put the Shiritaki noodles in just yet until I get the all clear from my diet lead but I put beansprouts in as a substitute. I have a fussy family so I quickly blanched my Shirtaki Mushrooms/Broccoli and Asparagus separately and then put those atop my beansprouts – my thinly sliced beef and some green onion – poured over this broth ………aahhhhh. It smelt devine and hit the spot. Bonus I have enough broth left over for tonight and I now know how simple this is to make. (I also used organic low sodium/0 Carb beef broth – but I will buy some bones and do it the proper way – I am sure the flavour is even more intense. YUM YUM I am so glad I googled 🙂 Thanks! (PS I did two dinners last night as I didn’t think my kid would eat it – he saw me and said I’d eat that if it had noodles in it hahaha – so thats his supper later too!). Yehah! 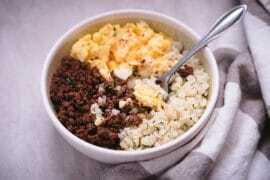 I was thinking of doing this with shredded cabbage..
Do you happen to have the nutritional content of this dish? How big are the slices of garlic? Came across your Pho recipe and am drooling! Joyfully completing your informationsite sections to receive additional recipes and Low Carb/Keto suggestions. So excited to try this! Which style of noodle do you prefer for this dish? I see they have angel hair, fettuccine and spaghetti… also, can these noodles be found liar locally, like Whole Foods or Trader Joe’s? Thank you in advance! I prefer the skinny ones for sure. I have found shirataki noodles at Safeway in the refrigerated produce section, usually where they store the tofu and refrigerated salad dressings. Hope that helps! Pingback: 31 Keto Chinese Recipes To Go Crazy For! Have you (or anyone) tried making chicken pho?? I’m not a huge fan of beef pho but love chicken and miss it tremendously!! Thanks in advance! So what if I do shortcuts and buy bone broth instead? What changes for the recipe? I don’t really have to ability or access to do beef broth from bones. You just miss out on all the spices/aromatics that are cooked into the pho broth. Traditional southern Vietnamese style pho cooks the broth with star anise, cinnamon, cloves, cardamom, and maybe 1 or 2 others I’m forgetting (Hanoi-style pho has a slightly different spice profile, but I’m not familiar with that one). These spices/aromatics are what makes pho broth different from bone broth. You could probably try putting the spices in a spice bag (or coffee filter) and simmering them in the bone broth for awhile, but I’ve never tried that, so I’m not sure how much of the flavor you get. It’s not the real deal, but it curbs a craving. Pretty much like any other low carb/ketofied version of an original dish. On a side note, I was recently at a Vietnamese restaurant and they had zucchini noodles you could substitute instead of the rice noodles. It was a pretty cool offering and certainly more “authentic”. why don’t you make it and try it for yourself? you can’t judge it until you try it, right?